Sid is in love with Mushrooms. He has, since the time he used to call them MAASHUMS! There was a small phase when he had started to call it "Fungus", after a science class in school. That grossed me out completely and I had stopped buying it, until Sid started to call it by its original name. Apart from that stray incident, mushrooms had been a constant item on my grocery shopping list. You will find me adding mushroom to almost everything; from stir-fries, to frittata; soups and stews to pastas; topping my pork chops and steaks to adding them to my veggie burger mix. But rarely has this amazingly versatile, incredibly meaty and ridiculously nutritious veggie/fungus, been the star of the show. It has always been in the supporting cast. It's time it lands up in a lead role! But before the recipe, lets address an ongoing debate - to wash or not to wash your mushrooms! Mushrooms are porous and when exposed to too much water, they quickly absorb it and becomes soggy. Hence, the best way to clean mushrooms, without sacrificing their texture and taste, is to clean them using minimal water. It is generally recommended to simply wipe them with a slightly damp paper towel or kitchen cloth. Or using a specialty 'mushroom brush', available at most kitchenware stores. But me, being me, I have a mental block. I need to wash them. With the amount of dirt and muck stuck on them, simply wiping with a wet cloth won't give me mental peace. I however, prep the mushroom just moments before then land on the pan. They are the last on my list. I do not soak them. I wash them two at a time (or more depending on the size) under running water, scrubbing and removing the grit with my fingers. I place it on a colander, lined with a paper towel to absorb the residual moisture. Once all the mushrooms are washed, I go around with another dry towel to absorb any excess moisture. I promptly slice or dice it up and in the pan it goes. The entire process doesn't take more than couple of minutes and my mushrooms have never gone soggy. This is an ridiculously simple recipe. It's hardly a recipe, actually. 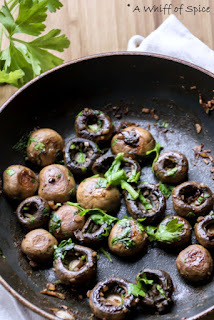 All you do is saute whole baby mushrooms (sliced mushrooms will do too) in garlic and olive oil, season with salt and pepper and garnish with fresh parsley for a bust of freshness. If I am feeling fancy or cooking for company, I add a touch of butter along with the olive oil. The flavor is incredible. And since I am currently obsessed with Smoked Paprika, I sprinkle it on for a little smokey flavor. Its optional but highly recommended. On weekends, we rarely have breakfast. Weekends are all about sleeping in and having brunch. 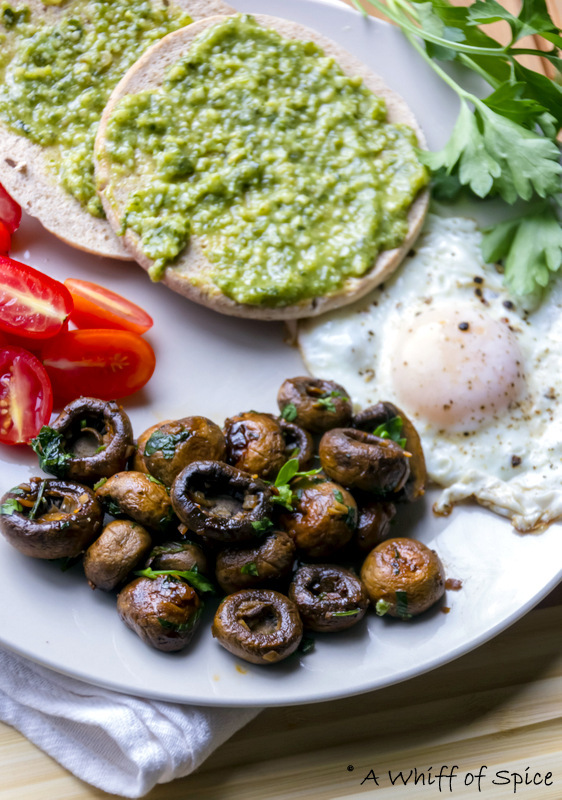 Our most frequent brunch option - toast with pesto, eggs (mostly sunny side ups), tomatoes with olive oil and sea salt, a giant side of this Breakfast Mushrooms - Mushrooms Sauteed with Garlic and Parsley and a bowl of fresh fruits to sweeten things up. This Breakfast Mushrooms is such a loved side dish that, it has been requested to be a part of our Christmas brunch too. Though I call it my Breakfast Mushrooms, they are certainly not restricted to breakfasts. They are awesome side dish to go with steaks or pork chops. And even a s part of a larger dinner spread. Crimini Mushroom (or White Button Mushrooms) - 2 (8 oz) tubs, washed/scrubbed and thoroughly cleaned, kept whole if small or thickly sliced, if too big. Fresh Italian Parsley - 1 cup, loosely packed and finely chopped + more for garnish. 1. Thoroughly clean the mushrooms. Either scrub with damp towel or wash it under running water. Pat dry with a paper towel. If they are small, keep them whole or slice them thickly, if big. 2. Heat a non stick pan over medium heat. Add 2 teaspoon of olive oil and let it shimmer. You can also add a combination of olive oil and butter. 3. Add the minced garlic and toss it around so it is doesn't burn. 4. Once the garlic is slightly golden, add the cleaned mushroom. Toss it around so that, the mushroom is coated in oil. 5. Add the salt and pepper and the smoked paprika and keep tossing. 6. The mushroom will release some water. Crank up the heat to medium high and keep tossing and moving around the mushrooms till it is tender and browned. About 6 to 10 minutes, depending on the quantity. And your nose will know it too. The aroma of a well browned mushrooms is hard to miss. 7. Add the chopped parsley and give every thing a toss for another minute. 8. Serve it warm with another sprinkle of chopped parsley for a bust of freshness. This aromatic mushroom, along with warm toast, fried or poached eggs and a small cup fruits, makes a well rounded breakfast option. People do not usually consider mushrooms, including crimini mushrooms, as a part of their meals that can offer great nutritional value. 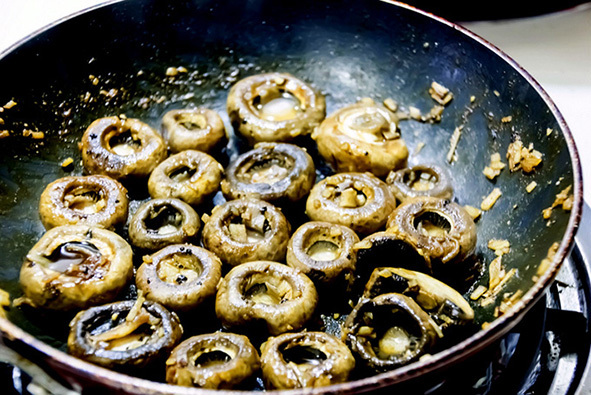 However, the nutritional value of crimini mushrooms may surprise you. 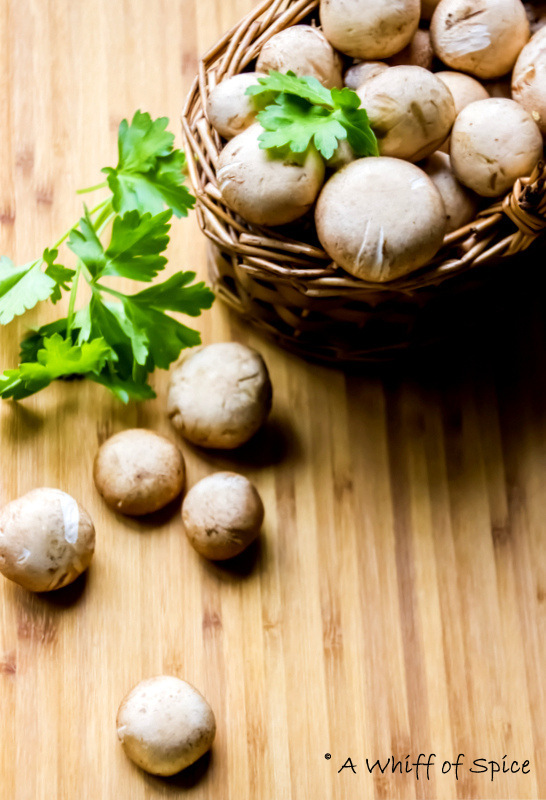 One cup of crimini mushrooms provides a good, very good, or excellent source of 15 different vitamins, minerals, and antioxidant phytonutrients. To maximize their flavor and the retention of their nutrients it is important to not to overcook them. That's why we recommend healthy sauteing crimini mushrooms for just 7 minutes to bring out their best flavor while maximizing their nutrient retention.